Molly's younger brother doesn't have much luck with the ladies. After seeing Sam miserable after being dumped yet again, Molly steps in with a few hints and tips on how to meet women and, most importantly, how to keep the relationship going beyond a couple of months. Molly has been trying to follow in her entrepreneur mother's footsteps and create a profitable business for years. She has the ideas and the passion needed but, like all the other ventures she has cooked up and abandoned, her latest business has failed. But then she sees how successful Sam has been since she guided him on how to improve his relationships with women and when his friend is in need of some advice too, Molly spots a gaping hole in the market and sets up The Bad Boyfriends Bootcamp. The bootcamp aims to transform lazy, scruffy singletons into caring, attentive boyfriends. And perhaps, while creating perfect boyfriends, Molly can find one for herself along the way. The Bad Boyfriends Bootcamp is an amusing book, which had me laughing out loud in places (particularly the Oxo Tower part). Although she wasn't perfect (as her friends discover along the way), I really warmed to Molly. She was warm, funny and caring and I loved the close bond she had with her brother, Sam, and the banter between her and Sam's friends. I also loved the friendships that were built up in the book and thought that, despite a few niggles, Molly, her best friend, Rachael and new friend, Josie, made a fantastic team. 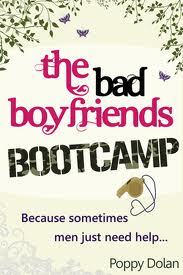 There was humour throughout the book, making The Bad Boyfriends Bootcamp an immensely enjoyable read. Thank you to the author for providing me with a copy to review. I will be chatting to Poppy on Friday (7th September).